I made these today and I'm really happy with them. I've had these 30's prints for a while and a couple of them I think are quite ugly but I like how the blocks turned out. 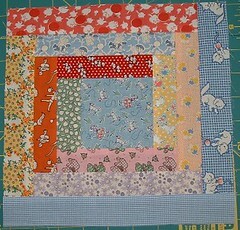 If anyone wants to swap scraps with me, let me know here and I'll set it up. Just wanted to post again that I got this idea from Melly and Me. 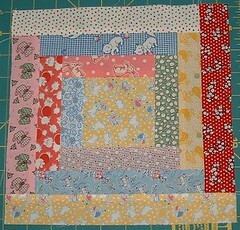 I did make my blocks bigger; the finished measurements are: center square 3", logs 1" wide. 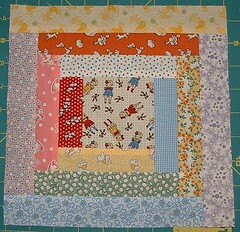 Finished blocks are 9"--approximately. And. Anybody have any ideas for getting the pictures to line up just in one column here? This is ridiculous.